In 1862, Facundo Bacardi bought an old, tin-roofed distillery near the Santiago de Cuba harbour. There he created the spirit that would define the world’s standard for quality rum, smoother and more drinkable than any before. Today, his original recipe continues to be a family secret. Fortunately, it’s been passed down through six generations of master blenders. 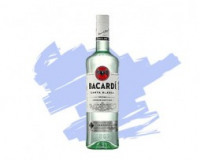 Bacardi is the world’s first refined rum. It is double filtered through charcoal for smoothness and aged in natural white oak for character.